The Golden Globes Left-Wing Virtue Signaling Night, last night, as presented by hideous leftist Hollyweird hypocrites, succeeded in doing exactly what we expected: they unwittingly made idiots of themselves. I don’t know. Like anyone who lives for attention, the Hollywood set knows that your good thoughts don’t matter unless everyone in the world knows you’re thinking them. (If I may critique the critique: the term “good thoughts” is subjective. For example I have no illusions about the left-wing, rabidly anti-Trump meme “RESIST!”, as broadcast in last year’s hideous show, being a “good thought.”) …And what they apparently don’t know is (well, aside from much of anything), their virtue-signaling actually highlighted perversions and immorality endemic in their own extended Hollywood/Media/ Democratic/liberal/ Progressive/Socialist family. George Bush, Donald Trump, Karl Rove, nor even Steve Bannon created “the casting couch” (although I’m sure someone — possibly a contributor on “resist” central, MSNBC, although I doubt it will be Matt Lauer — will find a way to try to make it so). So they were railing against — virtue-signalling against — themselves(! ), even though (or perhaps because their profession is literally to pretend) they looked and sounded every bit like they were, as usual, railing against America (and make no mistake: that is their true passion). And what they also don’t know is the fact that this idiotic virtue signaling has a rebound effect. It actually makes us think not how virtuous they are, but rather it reminds us of how ridiculous, deceptive, immoral, perverted and hypocritical — how unvirtuous — they in fact are. 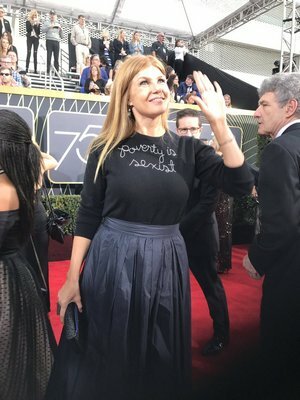 But when repeatedly, glibly, virtue-signalling by just saying it from on high isn’t enough, there’s this: aside from the ubiquitous “Times Up” buttons (they also wore “Free Tibet” back in the day, and more recently, that charming “resist” meme), this “poverty is sexist” outfit was worn by some actor named Connie Britton, and of course the media lapped it up. She stood out as particularly hideous (virtuous, to the media), not the least of which because the sweater looked like it was created by an eight-year-old. But also because it was just ugly. The sweater appears to be a product of Lingua Franca, which custom makes sweaters with activist-learning slogans stitched into them such as “I miss Barack,” “resist” and “The Future is Female.” The sweaters typically cost $380. Betcha they’d refuse to craft one saying “MAGA” (and betcha if they did, they’d get away with it with lots of support from leftists). In other words, last night’s viewing was more left-wing hypocrisy piled up on top of Hollywood limousine liberal hypocrisy.